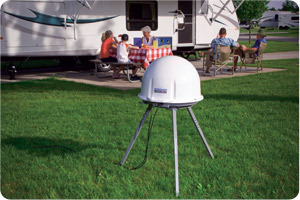 Compatible with all Winegard Carryout, Pathway and DISH Playmaker portable satellite antennas. Cross functional mount for maximum versatility. Adjustable Height and Level – Adjusts from 14.5″ to 22″. Quickly disassembles for compact storage. Built Tough – Built to withstand the harsh outdoor environments. Easy assembly with sturdy mount including ground anchor and bungee. 2 years parts, 1 year labor warranty. Aluminum tripod elevates your Winegard Carryout (GM-1518, GM-1599 or GM-MP1) portable satellite antenna off the ground for protection against dirt/mud/snow/water. Adjustable height settings from 14.5 inches to 22 inches. Sturdy ground anchor, 6 inches bungee cord and anchor loop hold the tripod and satellite antenna securely. Easy assembly; quickly disassembles for compact storage. Shipping weight, 4.4 pounds. Made in the USA. Great for short stops, wooded areas, boat docks, decks, etc. 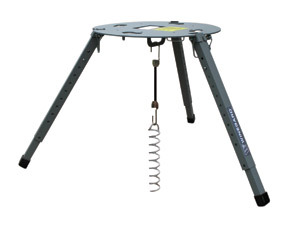 Aluminum tripod elevates your Carryout portable satellite antenna off the ground for protection from mud and water. Equipped with anti-theft protection — locking bolt secures the Carryout to the tripod. Weather resistant and extremely sturdy. Assembles easily and disassembles flat for compact storage, requiring minimal space. Elevating the antenna provides protection from mud and water and also helps to prevent tripping over the antenna. Designed, Manufactured and Hand Tested in the U.S.A.
Winegard Company is a respected world leader in the design and manufacture of innovative antenna products for satellite and terrestrial communications. Since its founding in 1954, Winegard’s pioneering solutions have shaped the industry for home, recreational vehicle (RV), truck, marine, medical and automotive antennas. Winegard is a privately-owned company that designed the first residential antenna for the U.S. It has designed more than 1,000 antenna models and does custom antenna design and development work. Protect Your Antenna – Makes usage easier while also raising and protecting your satellite antenna from damage and theft using the anchor loop. Winegard Antenna Experts – Leading US designer and manufacturer of quality TV antenna and signal reception equipment since 1954. Designed and built in the U.S.A.
15.70in. x 14.70in. x 2.30in.